Iris Atropurpurea D01, 2018. Archival pigment print, 47 1/4 x 40 3/8 inches. Iris Atropurpurea 04B P, 2018. Archival pigment print, 15 3/4 x 12 3/4 inches. Iris Atropurpurea 05B P, 2018. Archival pigment print, 15 3/4 x 12 3/4 inches. Iris Atropurpurea 06B P, 2018. Archival pigment print, 15 3/4 x 12 3/4 inches. Lilium Candidum D01, 2018. Archival pigment print, 47 1/4 x 34 1/4 inches. Lillium Candidum D02, 2018. Archival pigment print, 67 x 39 1/2 inches. Lilium Candidum 01P, 2018. Archival pigment print, 31 1/2 x 25 3/8 inches. Lilium Candidum 02P, 2018. Archival pigment print, 31 1/2 x 25 3/8 inches. Lilium Candidum 03P, 2018. Archival pigment print, 31 1/2 x 25 3/8 inches. Lilium Candidum 04P, 2018. Archival pigment print, 31 1/2 x 25 3/8 inches. Cyclamen 02P, 2018. Archival pigment print, 12 1/4 x 9 7/8 inches. Cyclamen 03P, 2018. Archival pigment print, 12 1/4 x 9 7/8 inches. Cyclamen 04P, 2018. Archival pigment print, 12 1/4 x 9 7/8 inches. Cyclamen 06P, 2018. Archival pigment print, 26 3/4 x 34 inches. Cyclamen D01, 2018. Archival pigment print, 39 3/8 x 31 1/2 inches. Cyclamen D02, 2018. Archival pigment print, 31 1/2 x 31 1/2 inches. Cyclamen D03, 2018. Archival pigment print, 39 3/8 x 31 1/2 inches. New Orders, Evertime 01, 2018. Archival pigment print, 13 3/4 x 18 inches. New Orders, Evertime 02, 2018. Archival pigment print, 13 3/4 x 18 inches. New Orders, Evertime 03, 2018. Archival pigment print, 13 3/4 x 18 inches. New Orders, Evertime 04, 2018. Archival pigment print, 13 3/4 x 18 inches. New Orders, Evertime 05, 2018. Archival pigment print, 13 3/4 x 31 3/8 inches. New Orders, Evertime 06, 2018. Archival pigment print, 17 3/4 x 20 7/8 inches. New Orders, Evertime 07, 2018. Archival pigment print, 23 5/8 x 28 inches. New Orders, Evertime 08, 2018. Archival pigment print, 17 3/4 x 23 1/4 inches. Installation image of Fragile Land​. Installation image of Fragile Land. Yancey Richardson is pleased to present Fragile Land, an exhibition of new work by London-based Israeli artist Ori Gersht. The show is comprised of photographs from Fragile Land, an ongoing project in which the endangered, native flowers of Israel serve as a vehicle to investigate ideology and the mythological narratives surrounding the concept of homeland. In the project gallery, Evertime, the first chapter in a new series titled New Orders, references the fragility and fragmentation of the European Union through the work of Italian mid 20th century painter Giorgio Morandi. This is Gersht’s inaugural exhibition with the gallery and the debut of both new series. Throughout his career, Gersht has taken a poetic, metaphorical approach to explore political conflict and the multiplicity of truth. During Gersht’s childhood in Israel, it was common practice to visit the countryside and collect what were referred to as the “flowers of Israel”. Considered symbols of the connection between the Jewish people and their land, the plants were collected to the point of near-extinction. For Fragile Land, Gersht procured or cultivated specimens, including cyclamen, Iris Atropurpurea, and the Madonna lily, all of which have played a significant role in Israeli and European cultural histories. Then, in a highly choreographed studio session, Gersht exploded each flowering plant with a bullet fired from a customized air rifle. Using an 8 x 10 camera and Polaroid film and a high-resolution digital camera to capture the event simultaneously, Gersht has captured two different realities, one of which is so technically precise as to exceed the capabilities of human vision and the other of which has the dreamlike quality of a memory. In many of his previous projects, Gersht has used the genre of still life painting to explore the fragile nature of existence and the duality between what is enduring and what is momentary, a contradiction embedded in the very nature of photography. In New Orders, Gersht references the instability and fragmentation of the European Union by recreating, in three dimensions, an individual painting by historical and prominent still-life painters from various countries, beginning with Chardin, Zurbarán and Morandi. For Evertime, Gersht commissioned masterfully crafted replicas of the vessels and bottles found in Morandi’s paintings. 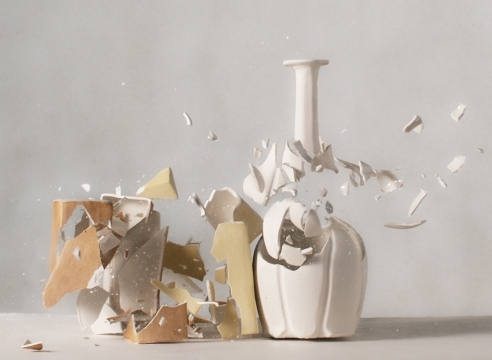 After carefully arranging and lighting them in a resolved composition, he fired on the ceramics with an air rifle, while simultaneously recording the destruction and fragmentation of the objects with a high-resolution camera. Sequences of images and panoramas relay a cinematic unfolding of destruction and collapse not otherwise visible in our normal experience of events.